The earliest evidence of grape vine cultivation and winemaking dates back 7,000 years. The history of viticulture is closely related to the history of wine, with evidence that humans cultivated wild grapes to make wine as far back as the Neolithic period. Evidence suggests that some of the earliest domestication of Vitis vinifera occurred in the area of the modern countries Georgia and Armenia. The oldest-known winery was discovered in the "Areni-1" cave in Vayots Dzor, Armenia. Dated to c. 4100 BC, the site contained a wine press, fermentation vats, jars, and cups. Archaeologists also found V. vinifera seeds and vines. Commenting on the importance of the find, McGovern said, "The fact that winemaking was already so well developed in 4000 BC suggests that the technology probably goes back much earlier." There is also evidence of grape domestication in the Near East in the early Bronze Age, around 3200 BC. The vast majority of the world's wine-producing regions are found between the temperate latitudes of 30° and 50° in each hemisphere. Within these bands, the annual mean temperatures are between 10 and 20 °C (50 and 68 °F). The presence of large bodies of water and mountain ranges can have positive effects on the climate and vines. Nearby lakes and rivers can serve as protection for drastic temperature drops at night by releasing the heat that the water has stored during the day to warm the vines. Climate is the most significant factor in determining a grape's inherent qualities. Each grape species has a uniquely preferred environment for ideal growing. Because climates vary from country to country, selecting the best strain is an important decision in grape cultivation. 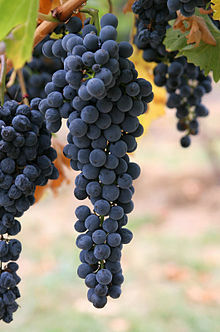 In addition, because climatic factors such as temperature and rain can be unpredictable and uncontrollable, each year will produce unique qualities and yields of grapes. Grape vines need approximately 1300–1500 hours of sunshine during the growing season and around 690 millimetres (27 in) of rainfall throughout the year in order to produce grapes suitable for winemaking. In ideal circumstances, the vine will receive most of the rainfall during the winter and spring months: rain at harvesttime can create many hazards, such as fungal diseases and berry splitting. The optimum weather during the growing season is a long, warm summer that allows the grapes the opportunity to ripen fully and to develop a balance between the levels of acids and sugars in the grape. Hot and sunny climates have a frost-free growing season of 200 days or more. These climates allow grapes to ripen faster with higher sugar levels and lower acidity. Cooler climates have a frost-free growing season of around 150–160 days. Cooler seasons force the grapes to ripen earlier which produces a fresher and more acidic harvest. In general, the average yearly temperature for most crops should average around 15 °C (59 °F) in order for the highest quality to be achieved in each grape. Summer: Ideal temperatures in summer average around 22 °C (72 °F). Ideal summer temperatures enable fruits to ripen. Temperature and sunshine are the most important factors in ripening. Winter: Ideal temperatures in winter average around 3 °C (37 °F). Ideal winter temperatures are necessary to allow grape vines to enter their resting phase. If temperatures fall too low, the crops can be injured. Spring and Fall: Spring and fall are critical seasons for grape development, because the plants are susceptible to frost damage, which can injure the fruiting buds. Wet weather in spring can increase the odds of mildew formation. To prevent mildew, some farms introduce devices such as heaters or large fans in vineyards. However, such solutions can be costly. Oidium is a powdery mildew that can attack all green parts of the vine. If left untreated, oidium can be terminal for the plant. It thrives in cooler temperatures and in the shade. Some North American vine species have evolved to show resistance to the mildew (3:37). Francesco Emanuelli; Silvia Lorenzi; Lukasz Grzeskowiak; Valentina Catalano; Marco Stefanini; Michela Troggio; Sean Myles; José M. Martinez-Zapater; Eva Zyprian; Flavia M. Moreira & M. Stella Grando (2013). "Genetic diversity and population structure assessed by SSR and SNP markers in a large germplasm collection of grape". BMC Plant Biology. BioMed Central Ltd. 13: 39. doi: 10.1186/1471-2229-13-39. PMC 3610244. PMID 23497049.